RAMPAGE. (DVD Artwork). ©Warner Bros. Entertainment. 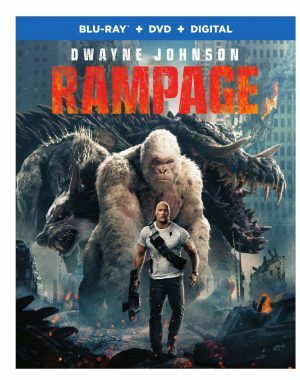 An unshakeable bond forms between an extraordinarily intelligent gorilla and noteworthy primatologist when “Rampage” arrives Tuesday July 17 on 4K Ultra HD, Blu-Ray 3D Combo Pack, Blu-ray Combo Pack, DVD and digital. Action star Dwayne Johnson (formerly known as The Rock) headlines the thrilling sci-fi adventure “Rampage,” directed by Brad Peyton. To make matters worse, it’s soon discovered there are other similarly altered animals. As these newly created super creatures tear across North America, destroying everything in their path, Okoye teams with discredited geneticist Kate Caldwell (Naomie Harris, “Moonlight”) to secure an antidote, fighting his way through an ever-changing battlefield, not only to halt a global catastrophe but to save the fearsome creature that was once his friend. “Rampage” also stars Malin Akerman (“Billions”), Jake Lacy (“Girls”), Joe Manganiello (“True Blood”), and Jeffrey Dean Morgan (“The Walking Dead”), P.J. Byrne (“The Wolf of Wall Street”) and Marley Shelton (“Rise”). Peyton directed from a screenplay by Ryan Engle, Carlton Cuse, Ryan J. Condal and Adam Sztykiel. The film’s story was written by Ryan Engle. The DVD contains the “Not a Game Anymore” featurette. “Rampage” will be available on 4K Ultra HD for a suggested retail price (SRP) of $44.95, Blu-ray 3D Combo Pack for $44.95, Blu-ray Combo Pack for $35.99 and DVD for $28.98. The Blu-ray 3D Combo Pack features the theatrical version of the film in 3D high definition and high definition; the Blu-ray Combo Pack features a Blu-ray disc with the film in high definition, a Blu-ray disc with the special features in high definition, a DVD with the film in standard definition and a digital version of the movie. The 4K Ultra HD Blu-ray disc of “Rampage” features Dolby Vision HDR. Also, the 4K Ultra HD Blu-ray and Blu-ray 3D discs of “Rampage” features a Dolby Atmos soundtrack remixed specifically for the home theater environment to place and move audio anywhere in the room, including overhead. “Rampage” will also be available on Movies Anywhere. Using the free Movies Anywhere app and website, consumers can access all their eligible movies by connecting their Movies Anywhere account with their participating digital retailer accounts. “Rampage” also is now available purchase from digital retailers. A romantic weekend getaway spirals out of control when “Traffik” arrives on Blu-ray (plus digital), DVD and On Demand Tuesday July 17 from Lionsgate. Starring and produced by Paula Patton (“Precious,” “Mission: Impossible—Ghost Protocol”), and written and directed by Deon Taylor (“Meet the Blacks,” Dead Tone”), the jarring thriller explores the gritty world of human trafficking and follows a couple’s fight for survival. Traffic also stars Omar Epps (“House,” “Love & Basketball”), Laz Alonso (“Detroit”), Roselyn Sanchez (“The Game Plan”), along with Missi Pyle (“The Artist”) and William Fichtner (“Crash”). Taylor told Frontrowfeatures.com in April that he never imagined he would make a film about human trafficking until the day he received a cautionary email from his adolescent daughter’s school. The note advised parents and guardians not to leave their children at the mall unattended because of this growing threat in their central California community. The warning spurred him to begin researching the subject and what he discovered was shocking and disturbing. Taylor knew he had to spread the word about this growing danger through his art form. The former NBA player turned filmmaker watched documentaries on the subject but found little in the genre form that would reach the target demographic that could most benefit from knowing about this crisis. He began writing “Traffik” to inform, but wrapped it within an exciting thriller. Though his previous films were mostly in the horror genre (“Nite Tales,” “Chain Letter”), Taylor hadn’t made a thriller based on real events before. The thriller focuses on a fearless investigative journalist, newly fired from her job for wanting to publish hard-hitting news stories. Sulking over her setback, Brea (Patton), nevertheless, goes on a weekend getaway with her mechanic boyfriend, John (Epps), whom she loves but is unsure whether she wants to marry. Their trip to a beautiful remote hideaway in the mountains initially seems to be the perfect romantic setting for John to pop the question. But an odd encounter with racist bikers at a nearby convenience store/gas station and the unexpected arrival of their best friends who get into a lovers’ quarrel, portend trouble ahead. The tension already is high when they receive an ominous knock on the door following Malia’s (Sanchez) frustrated departure. A mysterious and seemingly troubled woman whom Brea briefly met in the convenience store’s bathroom earlier in the day demands the return of a satellite phone she left behind. Brea is reluctant to give it up, sensing there is something deeply sinister going on. Sure enough, their condo is surrounded by individuals who aren’t simply there to retrieve the phone. The couple’s friend, Darren (Alonso), a headstrong sports agent, ventures outside to talk to the strangers. Shots are fired and it soon becomes a fight for survival for Brea and John. The Blu-ray and DVD editions include extras that take viewers behind-the scenes with the cast and crew in two featurettes, offering a revealing account of what it took to create this harrowing tale of human trafficking. The Blu-ray and DVD will be available for the suggested retail price (SRP) of $34.99 and $29.95, respectively. 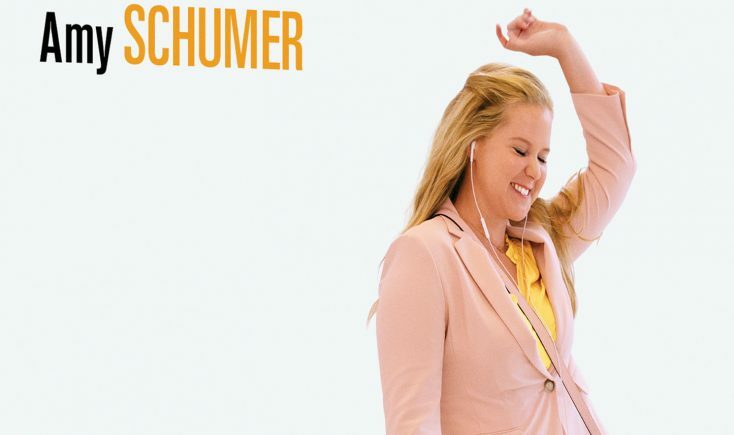 Amy Schumer stars in comedy “I Feel Pretty,” arriving on Blu-ray, DVD and On Demand Tuesday July 17 from STXfilms and Universal Home Entertainment. Schumer (“Trainwreck,” “Snatched”) stars as Renee, a woman who struggles with feelings of insecurity and inadequacy on a daily basis. After suffering a fall, she wakes up believing she is suddenly the most beautiful and capable woman on the planet. With this newfound-confidence she is empowered to live her life fearlessly and flawlessly, but what will happen when she realizes her appearance never changed? Filled with heart and humor from beginning to end, “I Feel Pretty” on Blu-ray, DVD and digital comes packed with exciting bonus features including deleted scenes, a gag reel and special featurette that take fans further into the hilarious and heartwarming story. The comedy also is available now on digital platforms. The critically acclaimed comedy is produced by McG (“Charlie’s Angels,” “Terminator Salvation”) and also stars an outstanding cast including Academy-Award nominee Michelle Williams (“Manchester By The Sea,” “The Greatest Showman”), Rory Scovel (“The House,” “Those Who Can’t”), Busy Philipps (“Cougar Town,” “He’s Just Not That Into You”, Aidy Bryant (“Saturday Night Live”), Naomi Campbell (“Zoolander 2”), Tom Hopper (“Game of Thrones” Sasheer Zamata (“Saturday Night Live,” ) and Lauren Hutton (“Nip/Tuck”). The Complete Second Season of the hit TV comedy series “The Good Place” arrives Tuesday July 17 on DVD from Shout! Factory. From the outrageous mind of Michael Schur, executive producer of “Brooklyn Nine-Nine” and “Parks and Recreation,” comes the side-splitting second season of the award-winning comedy starring Kristen Bell (“Veronica Mars”) and Ted Danson (“Cheers”). After Michael’s (Danson) disastrous attempt to torture Eleanor (Bell), Chidi (William Jackson Harper), Tahani (Jameela Jamil) and Jason (Manny Jacinto) for eternity goes belly-up, Eleanor and the gang are rebooted and Michael has to revise his plan to keep his torture subjects separate. Only now, Michael’s soul is on the line, as his boss, Shawn (Marc Evan Jackson), won’t allow another attempt. All 13 episodes from the newly aired NBC comedy’s sophomore season come to DVD with bonus features including extended episodes and new audio commentaries with cast and crew. Calling all Amy Schumer fans! Front Row Features is giving away a copy of her latest big-screen comedy, “I Feel Pretty,” on Blu-ray/DVD Combo Pack to three lucky readers. To enter the contest, simply email socalmovieeditor@aol.com by July 23 for your chance to win. Good luck! Next PostPhotos: ‘Rampage,’ ‘Traffik,’ ‘I Feel Pretty,’ More on Home Entertainment … Plus a Giveaway!! !